Doing this is relatively easy and requires one or two steps. First, you need to bind the radio and the quadcopter together. Additionally, you may need to configure the switches to make sure that they’re properly mapped to the flight controls. Turn on the radio. The LED on the radio will turn green to indicate that the radio is on. While holding down the BIND button on the quadcopter, plug it in. A red LED or the shark’s heart will blink rhythmically. This means that the aircraft is in binding mode. Ensuring that the radio is already on, hold down the power button for 10-15 seconds until the green LED starts to blink quickly. That puts the radio in binding mode. With both units in binding mode, the systems should automatically pair within seconds. The heartbeat of the shark will change pattern to reflect this, but be advised: it may happen quickly. No other indication will show that the radio and quadcopter are bound. To test the bind, power off the entire system then turn everything back on. At this point, try testing the ARM switch on the top right corner of the radio to check to see if the switches are configured. Flip the arm switch a few times to see if the quadcopter blades power up. If the propellers don’t spin up, move onto the switch configuration section. For this step, you’ll need the Betaflight configurator. Betaflight works through Chrome. Download the extension here and install it into your browser. On a PC, you may also see the icon on your desktop. Leave your quadcopter off then pug it into a computer using the included micro-USB cable. It may take a moment for the computer to register the device and the COM port to which it connects. In Betaflight, click connect on the top right corner of the main menu. 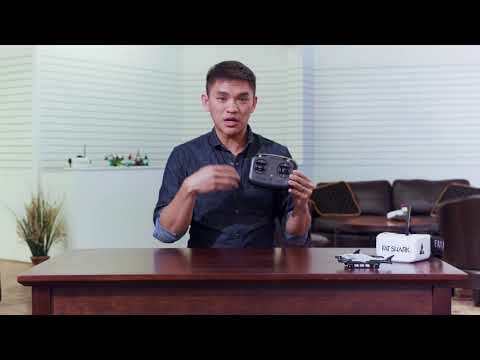 You may need to select the right COM port that your quadcopter is connected to. Once your quadcopter connects, you should see the gyro on your aircraft graphically represented on the screen. It’ll show the axis and orientation of the motors and aircraft. Once you verify that the quadcopter is connected, click the button that looks like a tiny drone radio or controller. This screen tests the inputs from your radio and will tell you if your hardware is properly bound. With the controller test window open, push the gimbals on the controller up and down to see if the system registers any movement (you’ll see the Roll, Pitch, Yaw and Throttle sliders move in coordination with the stick on the radio). If the sliders don’t move, the radio and quadcopter aren’t properly bound. Unplug everything and return to the Binding the Radio section. If you do see movement, move onto the next step. Select the icon with two switches to move into the Mode panel. Here, you can see if switches on the radio are mapped to arming the quad and selecting the flight mode.Each radio’s configuration may slightly vary, but one channel (here, AUX 1 or 2) should be mapped to ARM and another should be mapped to ANGLE.If the configuration on your quad isn’t similar to what’s above, you may need to add link the channels. Go back to the controller test window and flip each each of the switches on the radio to see which switch correlates to each channel. Then, go back to the Mode panel, click add under ANGLE or ARM and select either AUX 1 or 2. In the Mode screen, an orange hashmark under each channel should indicate the position of each switch. If you assign a channel (AUX 1 or 2) to an action (ARM or ANGLE), you can test that switch by watching the hash as you toggle the switch. The selected orange area on the slider indicates the region in which the action is active. For example, when the orange hash is under the orange hightlighted zone on this channel, the quadcopter is armed.Of note, the sliders also make it possible to change the action behavior as a function of the switch. You can slide active zone on each channel, for example, to arm the quadcopeter in a different position or change the assignment of each switch altogether. Each of these actions, however, is only recommended for experts. Once the quadcopter properly recognizes the radio and the switches are properly mapped, click disconnect on Betaflight and unplug everything. Power on the quadcopter with a battery, then test the arm switches. You should be ready to fly!